I confess, lemon meringue pie is a dessert that’s always challenged me. Soggy crust and weepy meringue are usually the issues I run into. 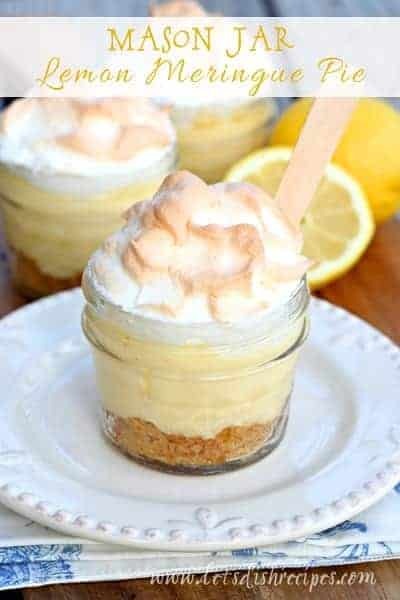 It just seems like whenever I try to slice a homemade lemon meringue pie, the meringue slides right off, and although it usually tastes fine, it’s a huge mess. Then I decided to try making lemon meringue pie in individual sized mason jars and all my problems were solved! First, these little pies feature a graham cracker crust, which doesn’t go soggy, especially since the pies only bake for 10 minutes. And even if moisture collects under the meringue, it’s not a big deal, because these pies are eaten right from the jar, so that meringue isn’t going to slide anywhere. Did I mention these are absolutely delicious and minus the required refrigeration time, only take about 15 minutes to make? They’re perfect for Easter dinner or any other spring or summer celebration. Preheat oven to 350 degrees. Place the Mason jars on a rimmed baking sheet. In a medium bowl, combine graham cracker crumbs, 1 teaspoon sugar and melted butter. Divide crumb mixture evenly between the 6 Mason jars. In a medium bowl, whisk together sweetened condensed milk, egg yolks, lemon juice and zest. Divide lemon mixture evenly between the 6 jars. With an electric mixer, beat the egg whites and cream of tartar until frothy. With the mixer still running, gradually add the 3 tablespoons of sugar and continue beating until stiff peaks form. Spoon the meringue over the lemon filling. Bake for 8-10 minutes or until the meringue is golden. Refrigerate for at least 2 hours before serving. These look so beautiful, Danelle. I bet they tasted wonderfully. These look so spring like and refreshing! Yummy little jars of goodness! These are so beautiful! I love the idea that it was made in a mason jar to avoid being messy. 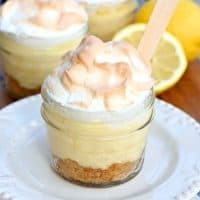 We could now eat lemon meringue pie without worrying the mess it would make and it’s even easier to make. Thanks for this! Is 8-10 minutes enough time to thoroughly cook the eggs in the pie-part? Just checking in, it seems like a very short time to cook the eggs. It’s a very small amount of filling, so it should be fine. I do have mason jars but will they hold up in the oven??? Yep, they’ll do fine. I’ve made these many times and never had a problem. Especially with the short cooking time required for this recipe. Wondering how well these Lemon Meringue in jars will hold up if they are not in fridge for 4 hrs…Idea is to have them prepared, set in fridge over nite. Take them too restaurant for wedding shower and put them at place settings and not touched for about 3 to 4 hrs?? ?